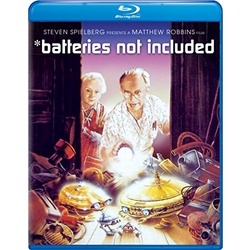 *batteries not included is a delightful fantasy for the whole family presented by Academy Award winner Steven Spielberg. When an unscrupulous real estate developer sends thugs to get rid of the last five tenants of a deteriorating apartment building, they need a miracle to save their building from demolition. One night, when all hope seems lost, tiny visitors from outer space mysteriously glide through their windows and begin to turn the tide with their magical powers. Filled with dazzling special effects, this amazing story of intergalactic warmth stars the acclaimed husband-and-wife team of Hume Cronyn and Jessica Tandy as a pair of feisty long-term tenants whose faith is rewarded in ways they never expected.